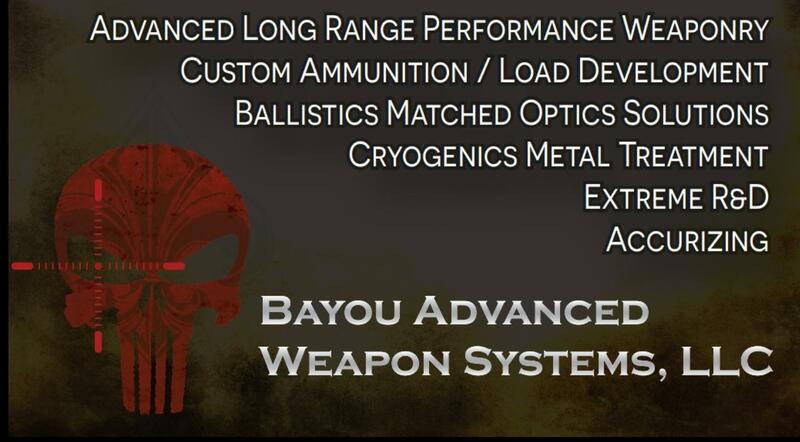 Bayou Advanced Weapon Systems, LLC now builds and sells exclusively the Signature-Series Rifles built by: CBJ Precision Engineered Rifles, Inc. and CBJ Precision LLC. These are available for exclusive private showings to Professional Hunters, individuals, or groups of ten or more by appointment and pre-paid fee-based only on-site private visits and consultation. CBJ (Corey James) will personally visit you or your group and bring along completed CBJ Custom Rifles for your inspection, shooting, and close personal examination. CBJ will answer all of your questions in a detailed, comprehensive manner both personally, technically and tactically absolutely any questions you may have. He is a master ballistics and loading expert and can answer absolutely any question you have regarding exterior ballistics of weapons and those you are considering for your lifetime hunt or collection. CBJ is able to address all of your unique and individual needs. Left-eye dominant, left-handed Southpaw? physical handicap, or other physical challenges or impairment? CBJ understands the adaptation of weapons to the special and unique needs of all his clients. CBJ does not see a handicapped person he chooses to see the opportunity to help and to ensure that his weapons can be enjoyed by all regardless of physical impairment or challenges.